Your host family has farmed at Grytubakki for many years, and Stefan knows every wrinkle in the land, which is 30 minutes north of Akureyri. Juliane’s organizational skills and cooking come from her Swiss homeland, and both are nicely flavored with Icelandic ingredients! In addition to a lovely group of young Europeans to help with the horses, they’re joined by their bright eyed son, Simon, who, not surprisingly, can carry on great conversations in several languages! A farm based ride: On the track of Gods, Elves and Vikings! Travelers from North America leave for Iceland on an overnight flight with an early morning arrival at Keflavik Airport in Iceland. After arriving at Keflavik International Airport the Flybus will take you right to the Reykjavik domestic airport, for a dramatic 45 minute flight to Akureyri, the “capital” of northern Iceland. Here Polar Hestar will pick you up for a short drive to their farmhouse Grytubakki for a hearty dinner and a good night’s sleep. After a copious breakfast riders saddle their horses. A short instruction brings riders into contact with the horses and off we go! Riding around mountain Höfði with the nice view out to the sea and the island of Hrísey, Iceland’s second biggest island. It is quite common to see minke whales, harbour porpoises, northern bottlenose whales as well as Humpback whales and dolphins. You ride close to the hill of the ravens “Hrafnabjörg” and above the valley of the cows. You’ll learn about the area’s history from the guide and you will be in the saddle for about 4 hours.Coffee and cakes awaits at Grýtubakki. After coffee it’s off for a drive to the fishing village of Grenivík and enjoy a warm bath in the swimming pool. Dinner and overnight at Grýtubakki. Today’s ride takes you into the valley of Fnjóská, the longest freshwater river in Iceland, a remnant of the glacial lake here about 10,000 years ago. You’ll ride wide sheep tracks, over gurgling brooks, into the amazingly green woods of Skuggabjörg. Coffee and cakes wait at Grýtubakki and then off you go for the swimming pool in Grenivík for a swim before dinner! The ride continues today around the river Gljúfurá and the rise above Grýtubakki. The trail leads you over sandy paths, through marshy country and over moorland. Birdwatchers get their money´s worth as whimbrel, golden plover, common snipe and a variety of ducks may be seen. There is a beautiful view over the Eyjafjörður where the river Fnjóská flows into the sea and also to Helguholl, the holy hill. It is said that under the hill there is a ship full of gold hidden by the Vikings of old. If somebody tries to get the gold, all churches which are visible from the hill will burn down.Nobody has tried to dig up the gold, not yet! With a ride close to the idyllic valley of the Elves your riding trip comes to an end, after 4  5 hours in the saddle. Coffee and cakes then dinner, will be ready for you at Grýtubakki. The price for this 6 day tour is $3017 per person. The price includes round trip airfare, with US taxes and fuel surcharge, from NYC, Boston, and Washington Dulles International Airport (ask for prices from Denver, Minneapolis, Anchorage, Seattle, and Toronto and other Icelandair gateways,) The flights to and from northern Iceland are included with most transfers as are accommodations in guest and farm houses with shared baths, all meals, as well as rain gear and safety helmets. You’ll need to bring a sleeping bag or make prior arrangements .to borrow one. *NOT included are travel insurance, breakfast and lunch on arrival day, lunch and dinner on departure day, and any additional travel you choose while in Iceland. 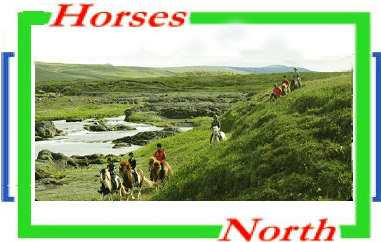 Accommodations on this Fascinating Northern Iceland tour are traditionally Icelandic. You’ll need to bring a sleeping bag and towels, soap and shampoo. Mattresses are provided. The farmhouses, mountain huts and cabins where you‘ll sleep are all warm and clean. Typically there are several beds per room, and in huts there may be one big room. Most will have shared bathroom facilities. Meals will be family style with lots of typical Icelandic cuisine which features fish, dairy products, lamb, and potatoes. Vegetarians can be accommodated with advance notice. We’ll send you a gear list that provides tips for packing, as well as info on converting money and electricity, weather advice (no guarantees, though) and other useful stuff. We can mail complete itineraries and will talk to you via e-mail or phone if you have any questions.